Hello people of the internet, how is you weekend going? Today I have spontaneously decided to take part in the 30 day snap challenge that Louise from Sprinkle of Glitter is doing. I had no previous plans to join in with this but today when I woke up I thought why not J If you don’t know what it is then click HERE to take a look at sprinkle of glitter’s explanation. Therefore here is my picture, now I am not sure whether this is cheating or not but I have made a collage, although my ‘official’ day one snap is the one in the bottom right hand corner. I think this essentially sums up my day of movies and a tasty treat. 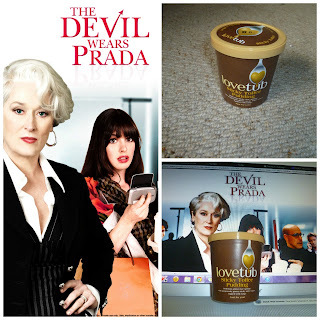 As I sit here writing this I am re discovering my love of The Devil Wears Prada, I Love this movie but like many I go through phases of watching it a lot and inevitably I then need a break, but I always go back to it. To accompany my film watching I have chosen a Love Tub, to be specific the sticky toffee pudding variety. Although they also come in two other variety’s the chocolate pudding and the chocolate orange volcano pudding. These puddings are amazing you put them in the microwave for 35 seconds (750w) and 30 seconds (850w) once done they come out of the microwave a wonderful melted gooeyness it is officially like heaven in your mouth. I highly recommend them to anyone who hasn’t tried go out and buy one I don’t know about other countries but in the UK you can buy them from selected Co-op, Morrison’s, Nisa, Sainsbury’s and Waitrose stores. What have you all been up to today? And what do you think of today’s choices? I love Devil Wears Prada and forgot about that movie in till I read your post. Thanks for reminding me about that movie. I am going to watch it again real soon. I will just connect with you on facebook. Definitely need to get myself a love tub! They sounds delicious! !